The River Blackwater (also known as the Munster Blackwater) rises in East Kerry and flows in an Easterly direction for over 100 miles, past the towns of, Banteer, Lombardstown, Mallow, Killavullen, Ballyhooly, Fermoy, Ballyduff and Lismore, on its way to meet the tidal estuary at Cappoquin. The estuary begins at Youghal and extends for all of 15 miles up to Cappoquin. The Munster Blackwater near Fermoy.There are many peat bogs on the upper river, which give the river its distinctive peaty colour, and ultimately its name. 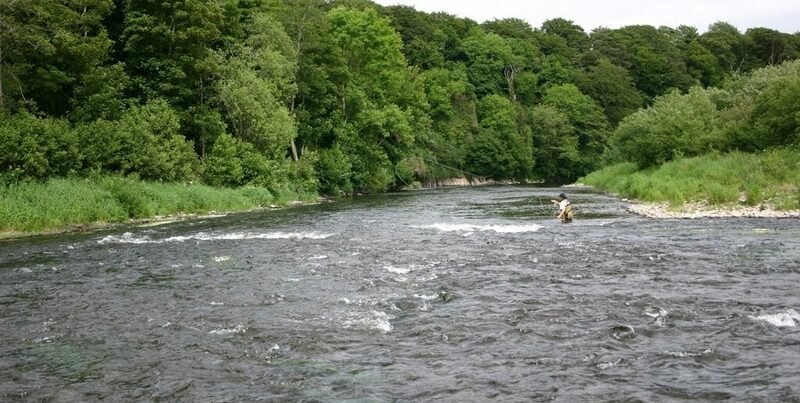 The Munster Blackwater gets one of the biggest Salmon runs of any Irish river, with perhaps the exception of the Moy. The Blackwater used to be a spring fed river but with drainage and water extraction it is now more of a spate system. It’s a big wide river with a mainly gravel bottom so wading is quite easy, and necessary in many places (bring chest waders). For spring fishing you’ll need a 15 foot rod, and whilst a shorter rod will do in summer, you’d still be better off with something approaching 13 foot. River Blackwater near Lismore.The main obstacle for Salmon running the Blackwater is the Careysville weir, which is downstream of Fermoy. In low water, very few if any fish, will run the weir and its takes quite a bit of water to get them up over. When the water does come the fish will run pretty hard towards the upper reaches of the river. There are very few clubs on the river and only a couple of those have salmon fishing rights. The Salmon fishing is nearly all private and it let by the fishery owners. Let’s take a look at the fisheries. Blackwater between Fermoy and Lismore. The town of Cappoquin is right at the top of the tidal estuary and is the first place on the Blackwater which is of interest to the Salmon fisherman. The club here has 4 miles of double bank fishing, which includes several named pools. There are day tickets available to the visiting angler. The main fly fishing pools are, the Canal Stream, Feericks, Kennel Stream, The Point, Kitchen Stream, Couples Quay, Bishops Stream, The Bleann and Steamers Quay. The following pools are more suitable for Worm, Shrimp (from 1st of June), and Spinning: The Hut Pool, Kitchen Hole, Mud Hole, Rock Pool, Lehanes Bank, Walls Break and the Factory pool. As you can imagine the water levels here are heavily influenced by the tides so it is worth while checking the times before setting off. The Fort William Estate is 3 miles upstream from Cappoquin, near the town of Lismore. The fishery consists of 3.5 miles of double bank fishing and is fly and spinning only. There are 5 beats in total and each takes 3 rods. The Fortwilliam fishery on the Munster Blackwater. The Blackwater Lodge is situated at Ballyduff Upper, just 6 miles upstream of Lismore. It has 16 separate beats on the Blackwater, the lowest being 3 miles downstream of the Lodge, and the furthest upstream being just below Mallow, a full 28 miles above the Lodge. Each beat takes 2 rods and averages about ¾ of a mile in length. Fishery at Blackwater Lodge.Since the Lodge has fishing on both sides of Careysville weir there is almost always good fishing on a selection of these beats. When you book you get rotated around the beats so that you have an excellent chance of a fish. Wading is pretty easy on all of the Blackwater Lodge’s beats as the bottom is mostly all gravel. The Gairha beat extends from the stream entering the river on the north bank, just up from Ballyduff bridge to Walsh’s Pool, just east of Summerfield. The fish in the spring run on the Gairha beat, average from 8 to 10lbs. In the summer grilse season the fish range from 2 to 5lbs and in later in the autumn the fish can range anything from 3 – 20lbs. The beat is fly fishing and spinning only. The use of worms, prawns or shrimps are prohibited, as part of the salmon conversation effort. Thigh waders will generally suffice for the middle section of Gairha, but chest waders may be necessary for the deeper pools, though the deeper you wade the greater the chance of disturbing the fish. The Gairha beat is run by Ralph And Caroline Tindal. See their website for further details. Summer on the Gairha beat. These fisheries are now under the control of Alfred Deppeler Fisheries. They are situated about 1 ½ miles upstream from Ballyduff Bridge, near to where the river skirts the R666. The fisheries account for 400 to 500 salmon per year. The Ballinaroone and Moscollop Fisheries on the Blackwater. The Careysville fishery starts at Clondulane weir and extends downstream for approximately 1 ¾ miles. It is all double bank fishing. This is one of the best known fisheries on the Blackwater which accounts for close on 600 salmon per year. The number of rods permitted fluctuates between 4 and 5 depending on the time of year. The spring fishing is excellent during February and March, with the Grilse fishing peaking in June. This fishery is situated a mile downstream of Killavullen Bridge, which is about 5 miles downstream from Mallow. The fishing is left bank only and extends for about a mile. The maximum rods are 4, with all methods allowed. The fishery includes the well known Poul Caum, and has a good mixture of streams and pools. It averages around 100 salmon per season. The fishery managers also let 3 beats of the River Lee. This fishery is run by Justin Green of Ballyvolane House. They have 4 beats available on the Blackwater at all times and have access to additional beats at various times, which total over 10 miles of fishing. The expanses of the Munster Blackwater.There are 2 beats at Ballyhooley, known as the Grange and the Quarry. There is a beat at Killavullen known as Fallon’s and 2 further beats downstream of Careysville, known as O’Neills and Kilbarry. The fishery also has access to the Gaihra beat at Ballyduff. These beats cover the salmon runs for the whole season and some are fly and spinning only. Almost all of the fishing requires wading with chest waders being the order of the day. This fishery is situated at Ballymaquirk Bridge, just North of Banteer on the R579. There is ¾ of a mile of fishing on the Blackwater and ¼ of a mile on the Allow River, which flows down from Kanturk. This fishery takes 3 rods and it has some nice streamy fly water, both on the Blackwater and the Allow. It gets a good run of Grilse through June and July. A singled handed rod is enough as this is well upstream on the Blackwater. The Lodge does sleep 5 but only 3 may fish at any one time. All methods are allowed but fly fishing is encouraged. The club holds trout fishing rights on the Blackwater between the Waterloo Bridge (N72) and Roskeen Bridge (N72). There is good salmon fishing here but it is held by a private syndicate. The view from Roskeen Bridge Banteer. The Millstreet anglers have around 10 miles of fishing on the Blackwater, the Finnow and the Aubane around the Millstreet area. The Salmon fishing here is much better towards the end of the season but it can be patchy. This is very good trout water with lots of smallish trout, averaging around ½ lb.